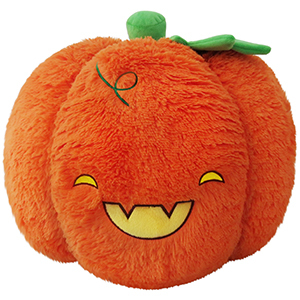 Squishable Pumpkin: An Adorable Fuzzy Plush to Snurfle and Squeeze! Etymology! It's the study of where words come from! For example, did you know that "Jack of the Lantern" used to be a nickname for the strange light that rises above peat-bogs at night? Gotta love those bogs! The obvious course of action was to immediately start constructing pumpkins with spooky faces to ward off the evil spirits. These days we don't have to live in bogs, so we carve these squash-sculptures to celebrate Halloween, also as an excuse to give lucky kids full-sized candy bars! Seriously, give out the full-sized ones. And nobody wants pennies, Marsha. NOBODY! Can't go wrong with pumpkins!! Super soft, and plushy! I got mine as a gift and I literally love it, he stays on my bed every night with that ghoulish smile:) so happy I have him!